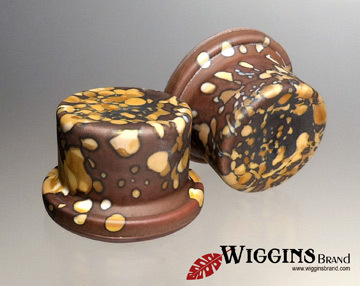 Custom speed knob set for an amazing Gretsch G6199T BillyBo replica for a customer from across the pond. 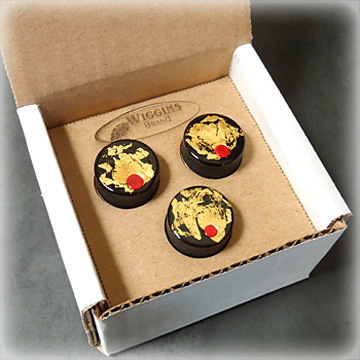 Our design concept with our customer brought us to a set of three speed style knobs in black glass, 24k gold leaf embedded into the glass, a red dot accent and then sides of the knobs were etched for a velvety matte surface. 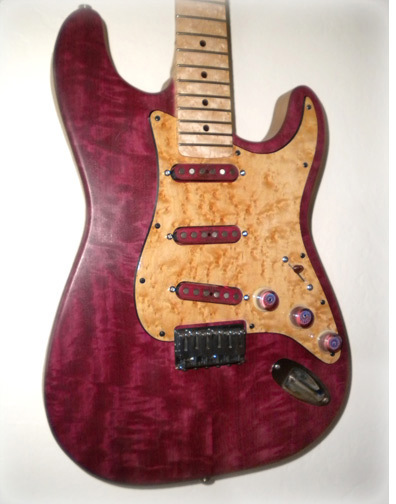 Our customer, WEB Guitars, had us make a set of pickups for this beautiful Strat using the same flamed purple heart wood used for the body. 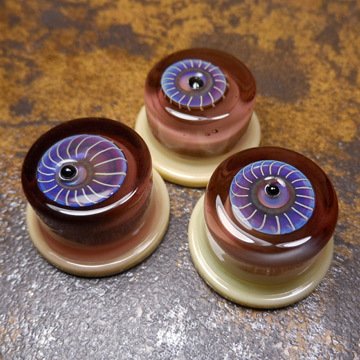 We also made the glass top hat style control knobs in a similarly matching transparent purple glass over cream colored opaque glass, and accented the top with handmade, lustered metallic murrini and a single raised & tactile black dot. 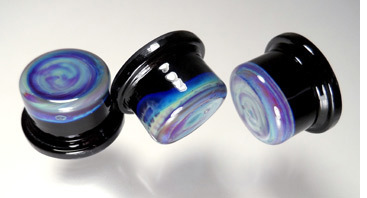 These knobs shimmer in the light, and are one-of-a-kind. 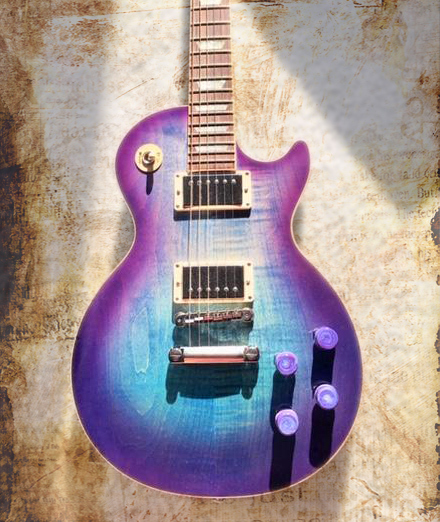 A gorgeous Prince tribute Gibson with intense custom purple swirled glass in speed shape knobs. 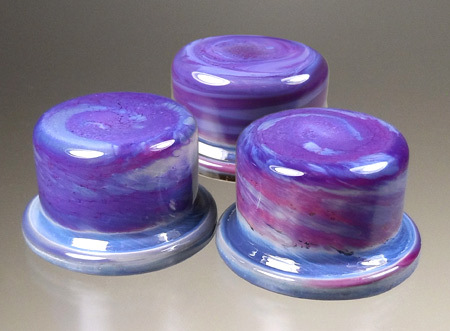 This luscious, one-of-a-kind color series called "Cosmos" is made with a very special, silver-rich glass that produces all these velvety blues and purple colors. 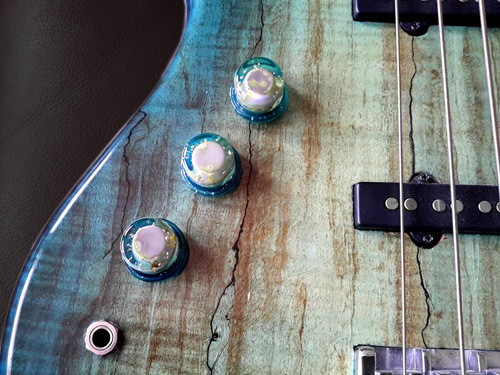 No two knobs are ever exactly the same. 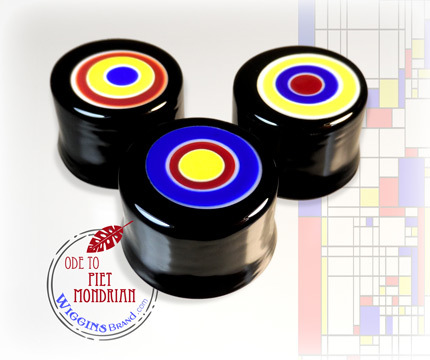 They're truly one-of-a-kind pieces of art and difficult to reproduce. 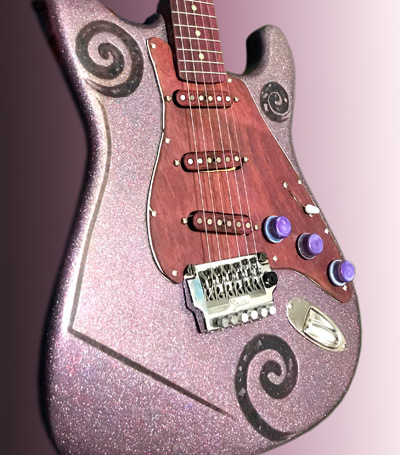 Another custom order made for a customer who created this one-of-a-kind Prince Tribute Guitar. 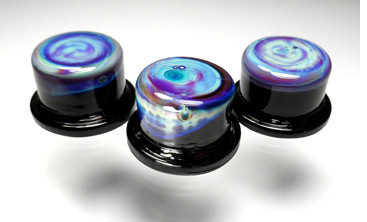 Uniquely intense purple glasses swirled together to create these top hat shaped knobs. 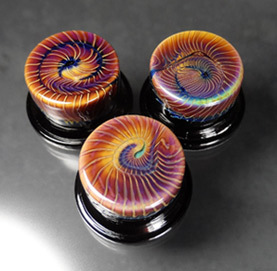 One of the cool things about being a glass artist, is that once in a while a great new color comes along, and you just know it's destined for something fun. 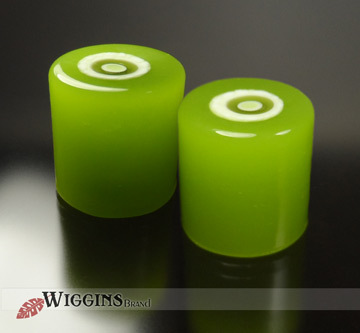 This new "acid green" is one such color, and it really is as juicy as it looks! 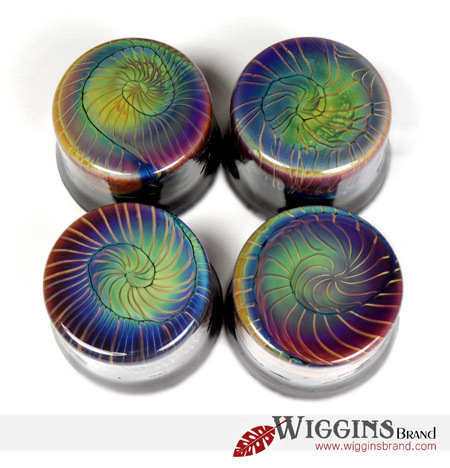 Knob sets with precious silver-rich glass that produces a rainbow of colors in this exotic twisted effect. 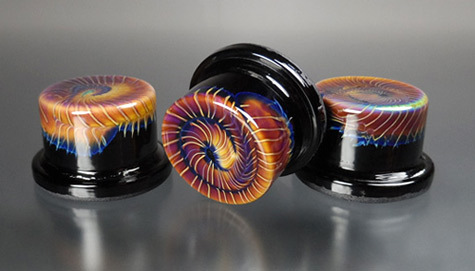 Top hat style top, speed style bottom. 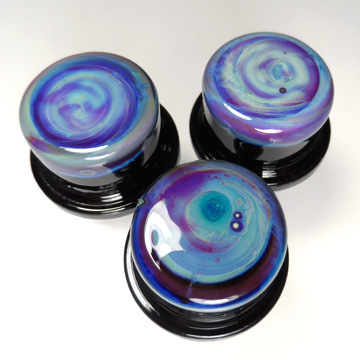 A sample of available colors in our "Hard Rock Candy" semi-opaque glass knob style. These colors are luminescent, & have a glow from within. 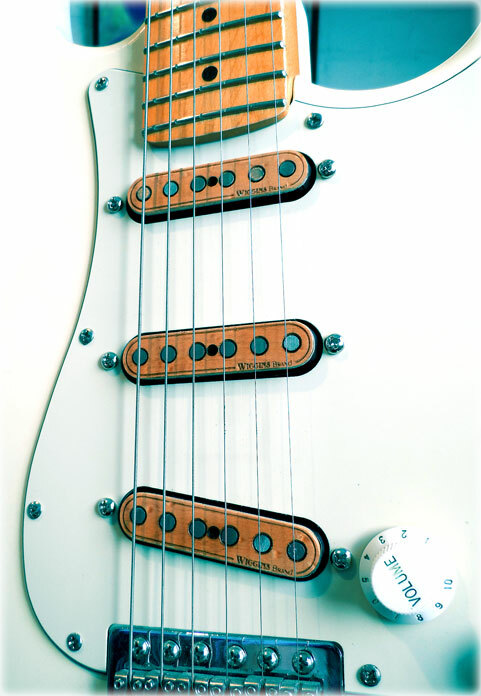 Knobs can be made in either Tele style (shown here), top hat or speed style in any color. 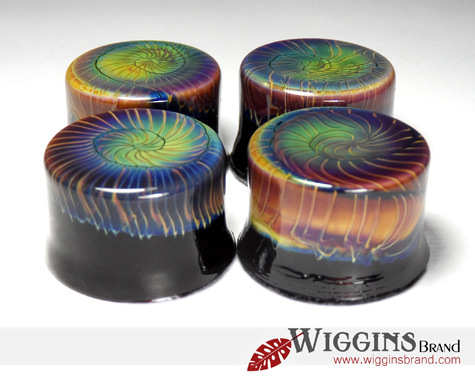 This is a new concept knob using highly reflective metallic "glitter" that shifts many different colors depending on the lighting and angle. Here, the colors shift from coral orange, pink, silver pink and greenish-silver. 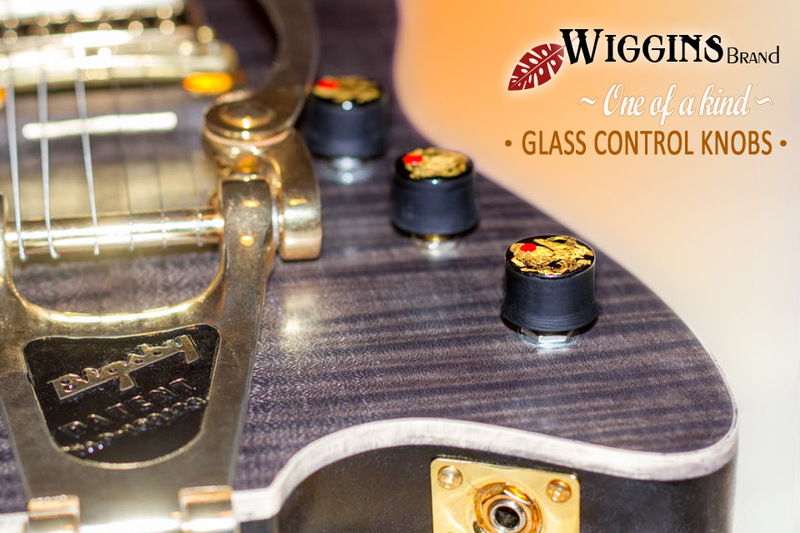 Because there is a clear glass "lens" over the glitter, the shape of this knob style has a rounded top and referred to as "bowler hat". 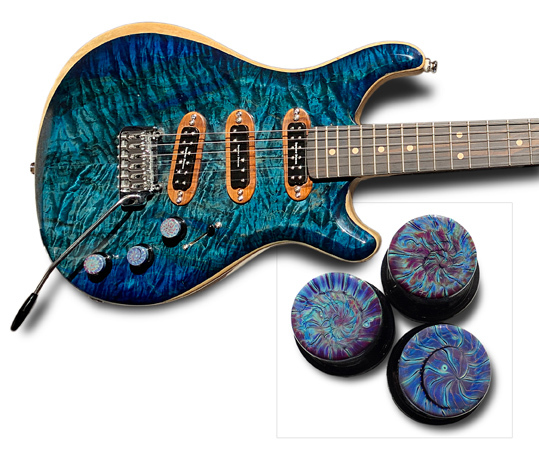 Guitar jewelry for a beauty in swirly blues, teals and purples! 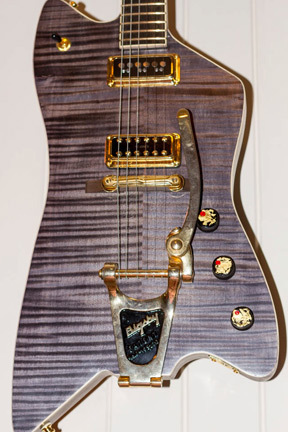 Incredible custom guitar by Todd Wright. 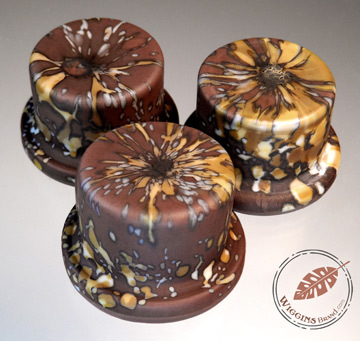 Etched matte top hat knobs in chocolate and caramel tones. Same colors were used in both sets, just worked differently to produce unique results. 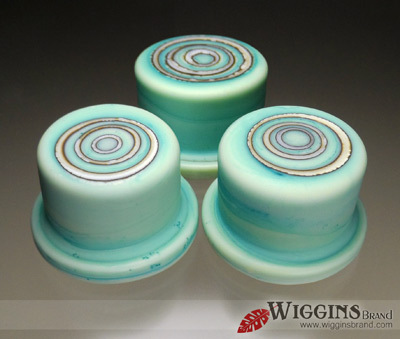 This beautiful set with variegated mint green and turquoise tones is achieved by using a special copper rich glass. 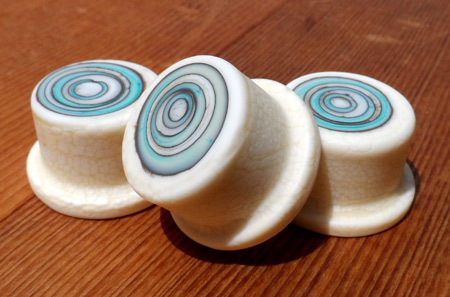 Cream and mint rings were alternately applied, and because the cream color reacts chemically with the mint, dark lines are produced where the two meet. It's a beautiful and striking effect. To finish the look, they were then etched to a velvety matte surface. 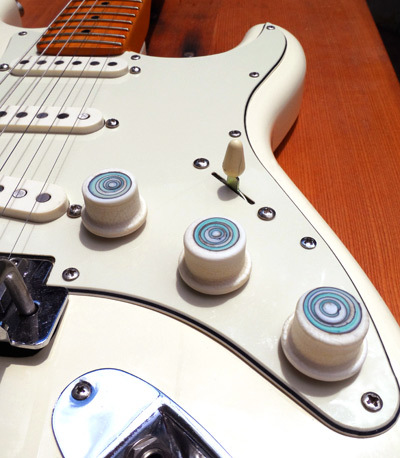 An alternate version of the concentric circle top hat knobs in crackled ivory. 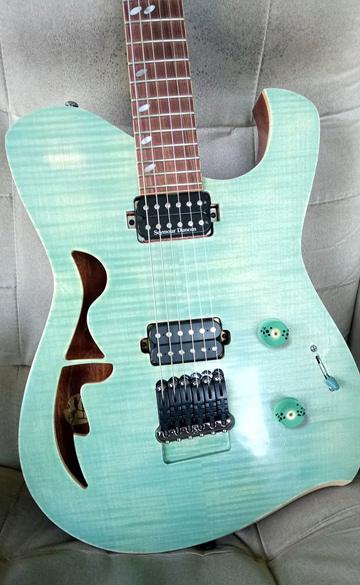 This was a recent and fun custom job. 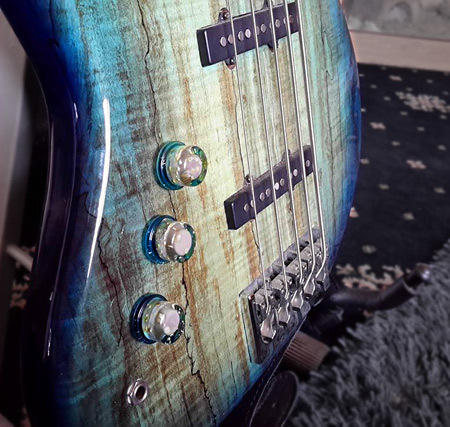 Our customer wanted something unique to go on his 5 string bass guitar, something that would compliment the gorgeous teal-green fade finish on the spalted wood body. 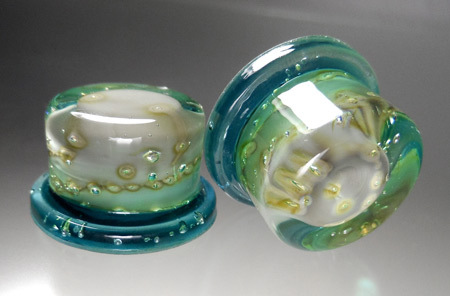 I came up with a series of top hat knobs that feature glass in transparent dark teal at the base that blends into a light bottle green glass at the top. 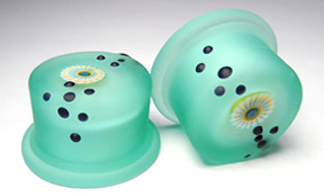 Interspersed throughout each knob are fine silver droplets and trails that have reacted with the grey-green opaque glass at the base to create interesting halos and designs. 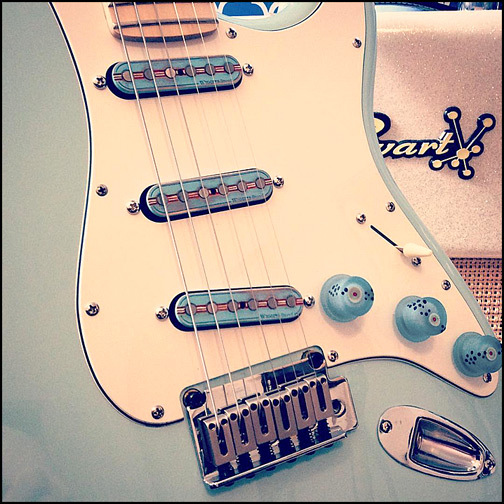 Above: This beautiful strat was outfitted with a set of our custom "Longboard" style hand painted pickups and matching "seaglass" glass guitar top hat style knobs. 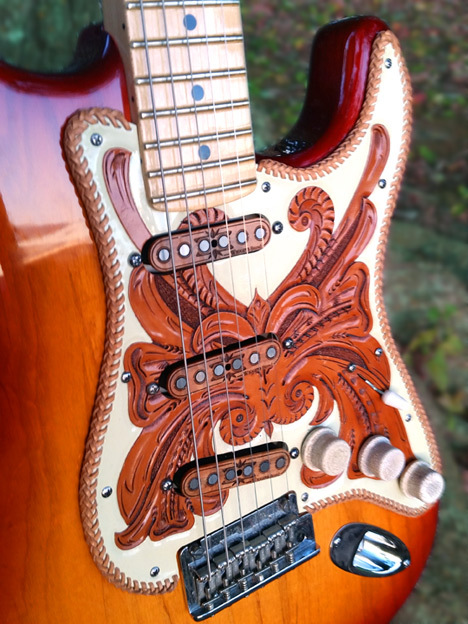 Above: A unique Strat with a custom, hand tooled leather pickguard matched with our "Western Design" pickups in a beautiful warm toned wood, and finished with three of our matte crackled "Reliced Ivory" glass guitar knobs.